Skills required: casting on, knitting, purling, increasing, decreasing, knitting in the round, I-cord edging (explained in pattern), yarn over, picking up stitches, binding off. Construction: This dress is worked seamlessly in the round, from the bottom-up, then the front and back are worked flat separately. Stitches are picked up at each side to work the garter side tabs, and along the straps to create the ruffles. The length of the dress is designed to be about mid-thigh, but the length can easily be shortened or lengthened. 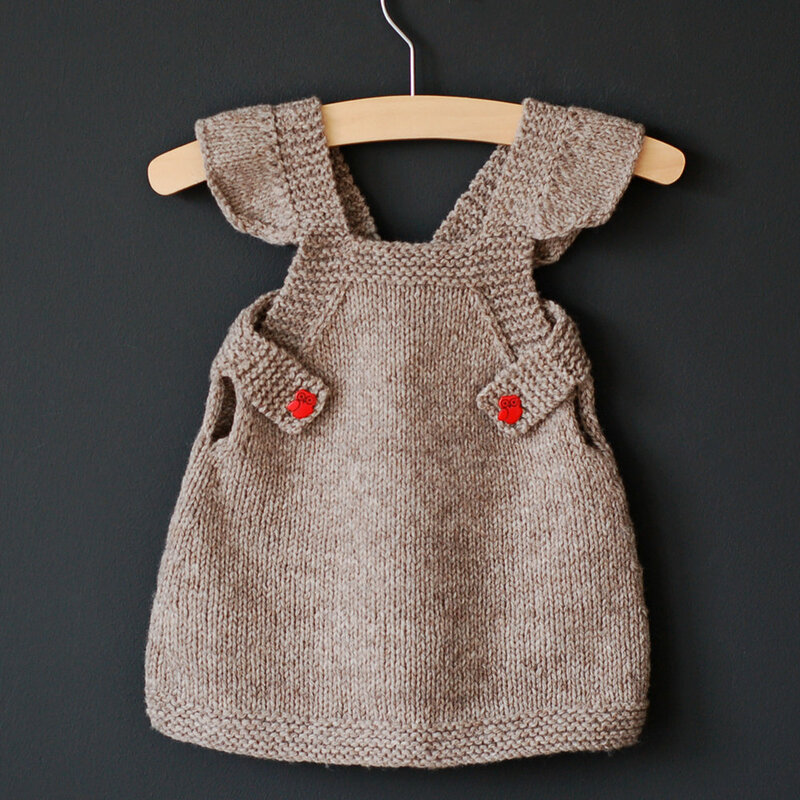 Easy-peasy cute apron-style dress that knits up in no time with an aran/worsted weight yarn. Can work for a going-back-to-school layered look, or as a sundress. To fit chest: 16, 17, 17.5, 18, 19 // 20, 22, 23, 24, 25 inches or 40.5, 43, 44.5, 46, 48 // 51, 56, 58, 61, 63.5 cm. Finished garment chest: 17.75, 18.75, 19.5, 20.5, 21.5 // 22.25, 24, 25, 26, 27.5 inches or 45, 47.5, 49.5, 52 54 // 56.5, 61, 63, 65.5, 70 cm. Yarn requirements: 1, 1, 1, 1, 2 // 2, 2, 2, 2, 3 skeins of De Rerum Natura Gilliatt 100% merino; 273 yards/250 m per 100g/3.5oz skein or approximately 200, 225, 250, 275, 300 // 375, 400, 475, 525, 550 yds or 183, 206, 229, 251, 274 // 343, 366, 434, 480, 503 meters of aran weight yarn. Please note: De Rerum Natura Gilliatt isn’t a machine-washable yarn. Superwash substitutes include: Malabrigo Rios, Debbie Bliss Cashmerino Aran etc. US 7 or 4.5mm 16-inch or 40cm circular needle or size needed to match stockinette gauge. Note: for the two largest sizes, a 24-inch or 60cm needle may be more comfortable.